There are a lot of talented young riders that filter through Canada’s national and regional race series every year, but some stand out above the rest. 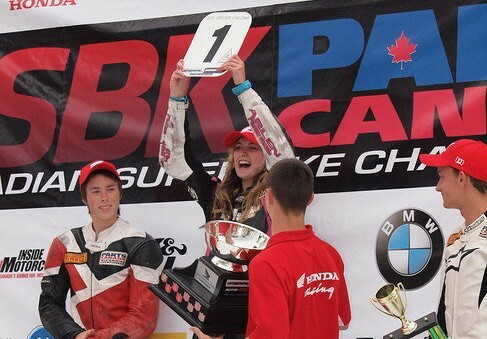 In four short years, the popular 18 year old Nesbitt has come from nowhere to become Canada’s first woman national champion, winning championships in the Honda CBR125 Cup, Honda CBR250 Cup, both the Amateur 600 and Amateur Superbike championships in the Ontario based RACE series, and placed 2nd and 3rd in the CSBK Amateur level. She has tried out for the Redbull Rookies Cup, Raced in Qatar and even been offered a place in the Spanish CEV championship. Clearly, Nesbitt is a racer with great potential. Grandstand spent time with her just before the start of her 2015 campaign, her first as a professional road racer. Grandstand : What is your number one goal this year? Stacey : My goal this year is to bridge the gap in my lap times to the Pro’s. I want to get down to their pace and be able to race with them. What machine will you be riding? I’ll be racing the same bike from last year, my Honda CBR600RR. We don’t have the budget to upgrade so I know we’ll be down on power but I’m hoping that will allow me to learn by making me push myself on a bit of a slower bike. You had great results in both CSBK and RACE last year. Was that an encouragement to keep racing, despite the difficulty in finding funds? Do you think there will be a steep learning curve in the jump to pro? We set goals at the start of the season of where I need to be at the end of the year if I want to make it to the next level and do well. Last year that was to improve my lap times by two or three seconds. When I achieve my goal I find it very encouraging because it’s realistic but at the same time not easy. My goal this year is to find another two seconds and be racing closer to the front of Pro Sport Bike class. I’ll definitely be pushing myself hard this year to get to that goal. How much more difficult has the off-track work (attracting sponsors, prepping the bike) been since moving up from the 250 class? It is very difficult. We were not able to attract new partners this year and we are down about 35-40% compared to last year’s budget. The CBR250 did not need much work whereas the sport bike needs to be built into a race bike, setup at the race track and uses lots more tires. I am so thankful for Pat who does most of the bike prepping as a volunteer. How much more difficult has the actual racing been? Is it more fun as well? I much prefer the 600 to the CBR250. The smaller bikes were fun and great to start off with but I love the speed and the power of the bigger bike. The racing has been harder because of the experience level of my competitors. The racers on the bigger bikes have been racing longer than I have at a more competitive level so you have to push yourself that little bit farther in order to race with them. But it’s all for the fun of being out there and at the end of the day if it isn’t fun it isn’t worth being on the track. 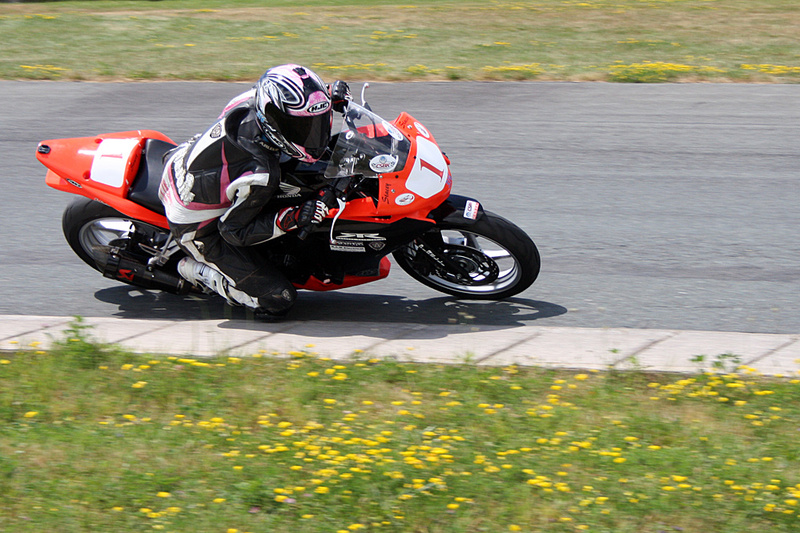 As far as I know, the last female in pro CSBK action was Marie-Josee Boucher in 2013. Does that make you more excited to finally move into the pro class this season? Yes MJ was the last but really once the helmet is on we are all racers. I’m excited that I will be racing and learning from the Pros that I have been watching for years. The fact that I have made it this far and I have even more to learn from them is what I’m looking forward to this season. Knowing there is a lot more to learn pushes and motivates me. As a follow-up to that - ever since you started winning races,there’s been lots of talk about you being a female racer. Do you ever wish people would stop focusing on your gender and just talk about your racing, or do you welcome the attention as an opportunity to help inspire other females? At the end of the day it is the results and lap times that count. So far I have been competitive at each level I have raced and that is what I will continue to try to do. It has not made much difference in attracting financial support and if it helps raise awareness that is great. I don’t really see myself as a role model but if it  inspires others I am happy about that. Are you hoping to race outside Canada in 2015? In past years,you’ve raced internationally, and I know you considered the EJC at one point. Are those still options, or do you want to focus on CSBK and RACE first, and worry about that later? It all boils down to lack of money. I had an offer from a Moto 3 team in the CEV junior world championship this year but the money they were asking to bring was completely unreachable. I think I could have been competitive in EJC but again it comes down to money. 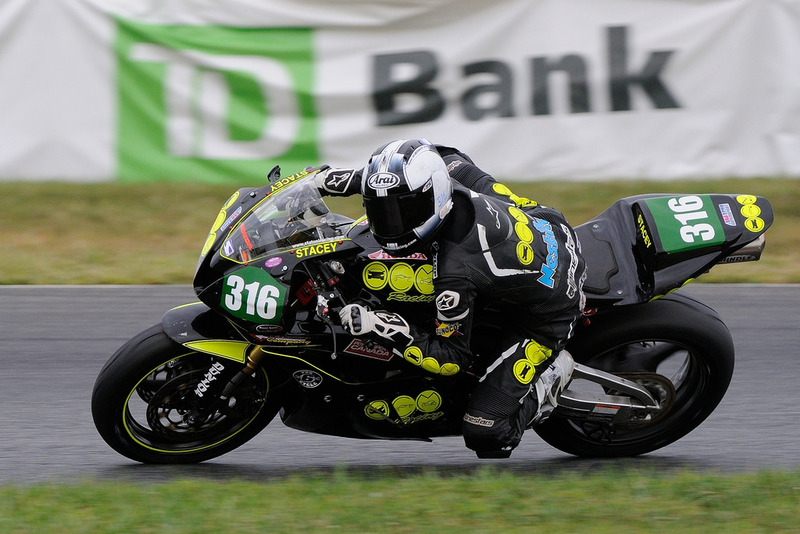 I will try to do as many CSBK and RACE rounds as the budget allows in order to keep learning and progressing. I’m keeping my fingers crossed something will come up so we can complete the season and even do some out of country races. You and your family have managed to work past the economic barriers to racing and stay in the hunt. How many other younger racers do you think are being held back by money issues in Canada? All of us! The cost to go racing far exceeds the potential prize money/contingency if there is any. That is why we are not seeing the majority of the CBR125/CBR250 kids on the grid now. My parents work full time for a company and have given up a lot for me to race. The effort they put in to go racing is like holding down a second job but they can only cover a fraction on the cost, especially at this level. I am very grateful for the sponsors and support we do have on board but we are still missing a large amount of budget needed to race this year. If we cannot find financial support it will be a very short season! We tried thinking of other ways to generate funding and I have started a Stacey Nesbitt Supporter’s Club where people can support me and donate through my website statoniracing.com. We have tried to be creative, for example, offering the opportunity for people to be my umbrella girl/boy on the grid of each CSBK race. I don’t think people really understand the effort and how expensive it is to make it onto the grid. You can check out my estimated costs for this year in the News section on my website. And lastly: Jordan Szoke races downhill MTB and also competes in Trials events. Jodi Christie tried his hand at flat track at season’s end last summer. What are the chances of seeing you trying some other sort of motorcycle competition to sharpen your skills in the off-season? I do some motocross training in the off season. This year’s preparation has been limited with wrist surgery and recovery. I would be open to try other types of racing but this is also limited by budget and location. Thank you CMG for the Q&A. I am appealing to anyone out there that wants to get involved and support me with my racing to get in touch with us through my website or facebook page.